November 17, 2014 By Allyson 5 Comments This post may contain affiliate links. Read my disclosure policy. I love making things from scratch, but sometimes it seems like certain things take more effort than they’re worth. Roasted Red peppers are not one of those things. 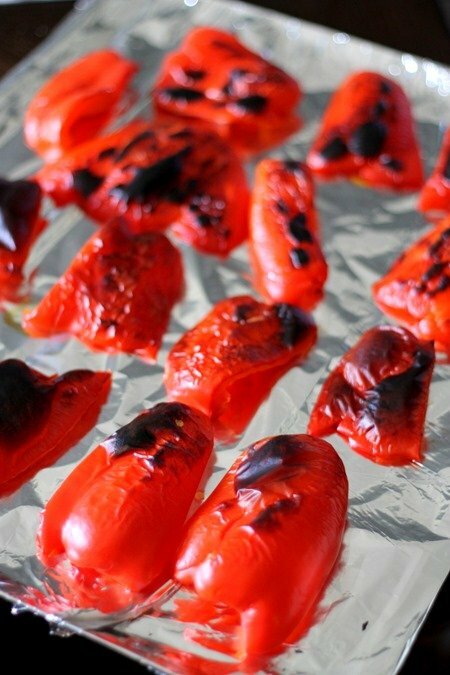 It’ is SUPER easy to roast red peppers, and they are so delicious when they are fresh. I always used spend $5 or more on a tiny little jar, and now I roast these all the time at a fraction of the cost. It’s especially a great deal if your market puts produce on clearance. I usually grocery shop first thing in the morning, and they put out a little shelf with tons of produce they need to get rid of before it spoils. I usually grab a few bags of peppers, and they charge .99 cents for 4-5 large peppers! It’s a total steal. You don’t have to worry about them spoiling if you roast them within a day or 2, and then you can keep them in the fridge for a while until you need them in a recipe. Okay, lets do it! First, preheat your broiler to HIGH. 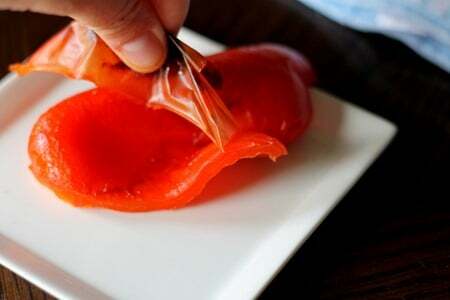 Next you want to cut the tops off your peppers and discard. Then take out the seeds and discard those. 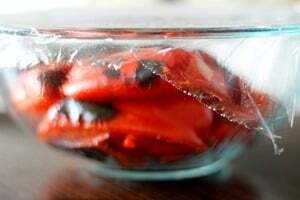 Next, cut your peppers into thick strips; I usually get 5-6 strips per pepper. Next, lay your strips on a foil lined baking sheet. I hate getting baking sheets dirty, so I always cover them, but it’s not really necessary. Then you want to place the sheet into the oven, about 6 inches under the flames and cook for 5-7 minutes, or until the skins are burnt and wrinkled. Watch carefully as you don’t want them totally scorched. 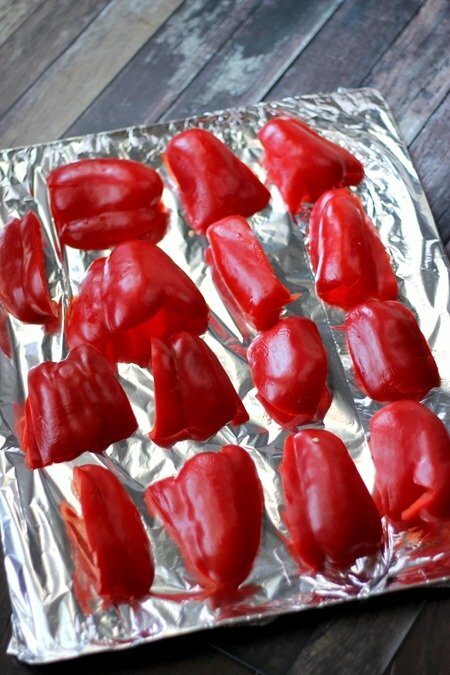 Remove the baking sheet from the oven, and dump the peppers in a glass bowl. 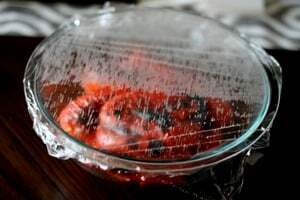 Immediately cover the bowl with saran wrap or foil. Set aside for at least 30 minutes, or longer if the peppers are still too hot to handle. Now you are going to pinch the peels of the peppers, and pull them off. They should come off very easily. Discard the peels. 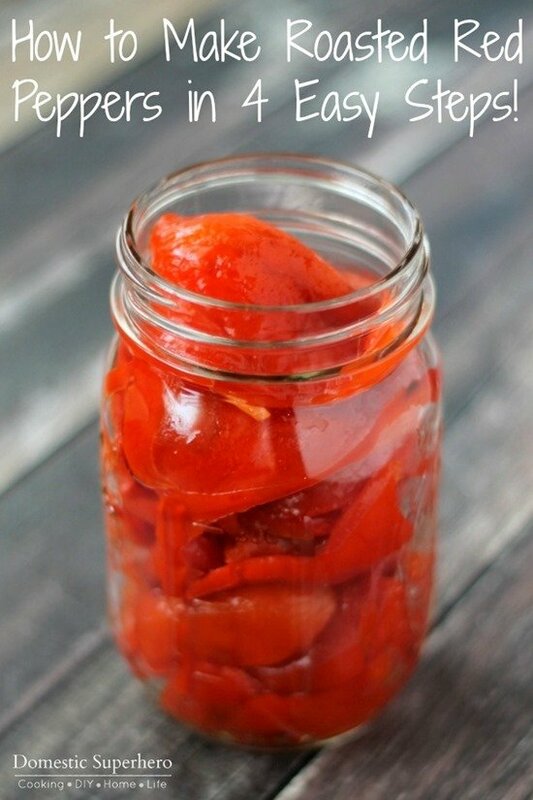 Now, if you aren’t going to use the peppers right away you can place them into a jar with an airtight top (like a mason jar), and add some olive oil to the jar (2 TBS should do it). Store in the fridge for for a few days, or put in the freezer in a freezer bag for up to 6 months (this is great because you can take them out as you need them! 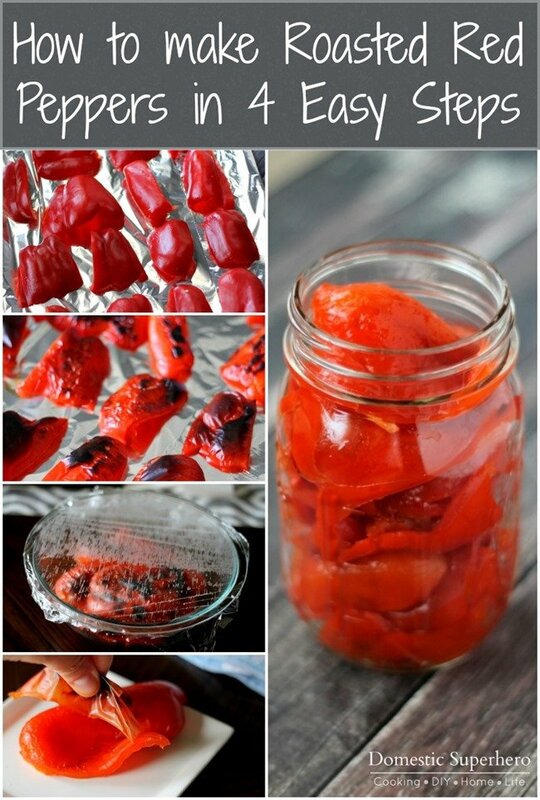 Need a recipe to use these Roasted Red Peppers in? 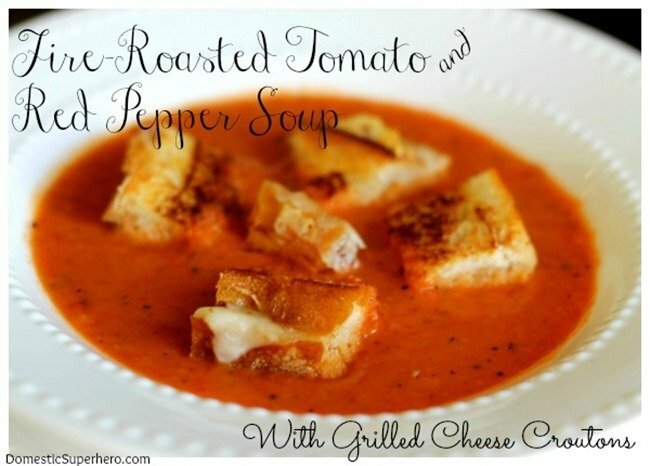 Try this delicious Roasted Red Pepper Soup – it’s delicious and SUPER healthy! Amazing. Probably the easiest thing I have done. I will not buy jarred again! Thank you for sharing. I didn’t know wait the 30 mins. I was a little excited and the skins were still pretty easy to peel. Such a great tip. Great! I am so happy you loved them! It’s incredible how easy and CHEAP it is to do it yourself! I’ve been doing something similar, but always used them immediately. Do you add olive oil to the bag when you freeze them?